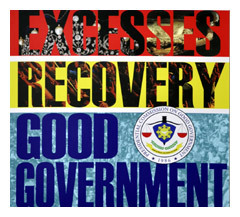 At the exhibit entitled Excesses, Recovery, and Good Government, which opened on 28 February 2011 at Greenbelt 5 in Makati City, Bautista emphasized that the new Commission’s efforts are directed towards setting the records straight. “What keeps us from getting anywhere are our own failings and our own misgivings as a people who demand good government without doing good deeds of our own. 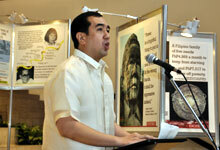 Our collective quest for good government continues to be a work in progress,” expressed Bautista. The PCGG was founded 25 years ago as the first act of Cory Aquino as President, primarily to investigate what happened to the millions of pesos that had disappeared under the regime of Ferdinand Marcos. The exhibit, which runs until 07 March 2011 and is partly sponsored by the Friedrich Naumann Foundation for Liberty (FNF) Philippine Office, included “archival photography of the lavish Marcosian plunder and displays of selected Marcos jewellery and artworks (Renaissance paintings, Russian icons, Yugoslavian naïfs, and precious Russian lacquer), the statistics on how much has been recovered and how much has been lost,” and the insights of the youth on the question: What does good government mean to me? The exhibit will be moved to other high-traffic areas and also to schools in Metro Manila and in the provinces to generate more public awareness. “The Aquino administration is resolute on curbing corruption in government. The exhibit can hopefully help new generations of Filipinos remember the struggle their parents endured 25 years ago to get rid of a decadent leader. Corruption should not be taken for granted. Everyone has a role to play if we want good government,” said Jules Maaten, FNF Country Director.